I’m sure you’re not surprised that I’ve been watching the equestrian events of the 2016 Summer Olympics. 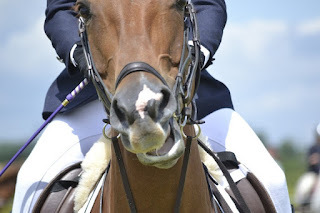 One of my favorites to watch is the eventing competition, which has been described as the triathlon for horses. Talk about some gorgeous, fit athletes! And yes, I am referring to the horses. One of the horses from the Brazilian eventing team has an unusual name: Summon Up The Blood. The announcers calling the competition noted that “summoning up the blood” is quite an accurate image of what is needed for this grueling sport. Though “Bob” (his much less picturesque nickname) didn’t win a medal, he did complete the entire series of events respectably. Click here to see photos and learn more about him and his rider, Carlos Parro. Eventing horses are cared for and pampered in every way possible: from optimum nutrition and carefully thought-out workouts, to chiropractic care and massage, to liniment baths, “ice boots” to cool their hardworking legs, and any number of high tech therapies. They are valuable partners to their riders (not to mention just plain valuable), and no one expects them to do their jobs without proper care. Why do we expect any less for ourselves? Yes, I am comparing myself to a horse. Bear with me. In July and August, we’ve had punishing heat and humidity, and I admit I’m dragging. The slightest effort outside (watering my orchids, for example), leaves me soaked in sweat and ready for a cold drink. I’m tired. I have no ambition. The idea of keeping after my goals, even my indoor ones, does not appeal. I need to “summon up the blood”—find a way to motivate myself all the way to the finish line. I’d love to skip to November when we usually get some cooler weather and I get an energy boost, but I also don’t want to wish away any of my life, not even the hot, sweaty bits. At this point in the year, I’ve lost the momentum and excitement of a new year, and the adrenaline panic of a waning year hasn’t yet set in. (“Oh, no, it’s December and I haven’t reached my goals yet!) Until then, how can I “summon up the blood” and maintain my motivation and momentum? Though I’m not quite as well-cared for as Summon Up The Blood, I am placing more emphasis on self-care right now. Since August is a low point for me, energy-wise, now is the time to sprinkle in treats and rest breaks. August isn’t the time for me to start major new projects. It’s the time to set small goals, and break down larger ones into ever smaller, teeny, tiny (easily accomplished) ones. In the ongoing bathroom renovation (yes, we’re still working on it), I’m trying to do one or two things per week. This week I ordered the replacement globes for the light fixture and called myself done. Now is the time to use my imagination to make the same old, same old more fun and/or easier and quicker. To lighten up my schedule to allow for my lack of energy. That energy will return, as long as I don’t overdo it now. I’ve even visited my chiropractor and had a massage to counteract the effects of stripping wallpaper and priming my bathroom walls. But I do draw the line at ice baths. Do you have any tricks to “summon up the blood”? Sounds like you're doing a pretty good job of existing in the terrible heat you're having. We spent last week in Colorado, which is always much cooler than it is here in Oklahoma. And while I'm basically a happy person and happy with my home and my life, I really hated to leave the cool weather and the pretty scenery. But we did, and I'm working on getting back to my "normal" routine. That seems to take longer the older I get. I have a hard time in heat and feel uncomfortable with the lack of energy that it produces. I accepted that I would have to stay in more during this summer, and do less, but somehow with that acceptance came a most beautiful summer. It's something about acceptance and expectations. It was interesting to read about the horses. I am left with memories of Black Beauty and the awful mistreatment, so it was nice to know that they are well cared for. Yes, caring for ourselves is do-able, isn't it...sometimes I have resistance though. I like how you are able to assess the reality of how you relate to the summer heat. Does everyone down there have air conditioning? I know it's articicial and energy consuming, but it is what saves me on some days. (I sometimes go to an air conditioned library). Wishing you a cool and low key August, R.
Cheryl--Lucky you visiting Colorado. Such a beautiful state, and definitely cooler than our home states. It does help to be happy at home (and I am except for the weather). Good luck getting back in your home groove! Rita--Most people here have air conditioning now, but my husband didn't have it when he was growing up, and it was not as common then as it is now. I would hate to have to live here without it. I think if we pay attention to what our bodies and spirits need, and take care of those needs, we are a lot better off. Hope you are having a nice summer yourself, and making the best of the temps, whatever they may be. Dear Kathy August here may not be quite as hot as in Fla. but I suffer with lack of motivation. I use this down time to catch up on my reading list. Sometimes we need an excuse to treat ourselves and what better reason than it is August! Have a lazy enjoyable day and try to stay cool. Hugs! Debbie--I think we're all dragging a bit in August. It's a time for those cold drinks, a nap or two, and taking it a little easier. Hope you're enjoying some laid back summer relaxation!